So it is a good thing that Jen picked red/orange for this month's rainbow colour challenge. Last month with the green's I had a little difficulty with my value selections so I tried the black/white edit button on my iPad to see if I hit the mark a little better this month. These are my four pieces dark, two medium's and a light. I believe I am getting closer. And here are my blocks in all their summer glory. I have continued to make a 12" and a 6" block each month. 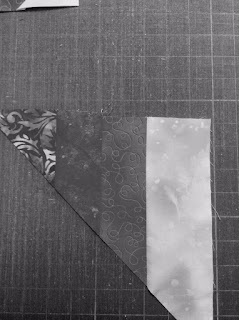 And for a wee spoiler alert, Jen has a few setting options that will crop up towards the end of this event that are different, interesting and manageable for all levels of quilters. Make certain to visit Jen's blog (here) for the free instructions for this month. And while you are there have a look around if you have not done so already. She offered a series of free Mug Rugs last year and those patterns are still available. 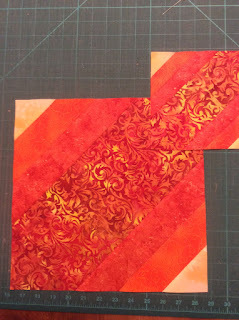 In September she is launching The Border Quilt Quilt Along. 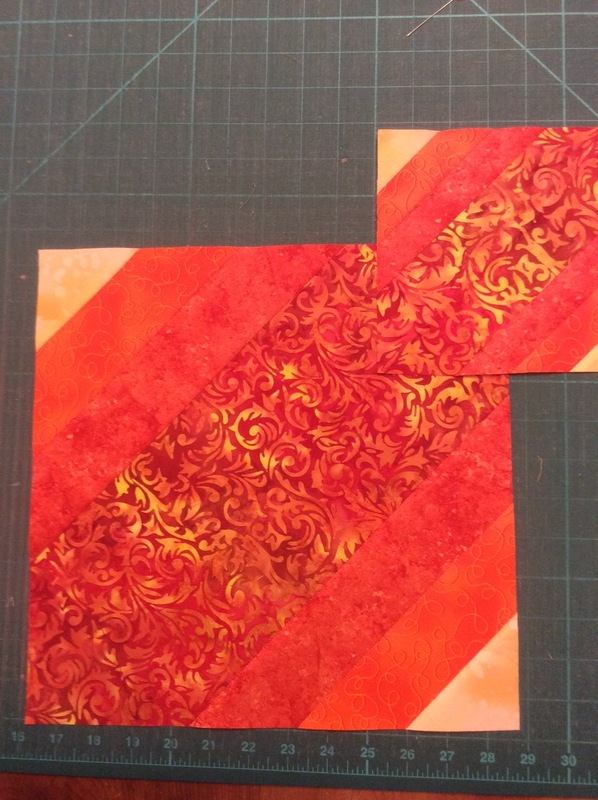 You will need to purchase the pattern to participate in this quilt along. The introductory post is up on her blog already. The Quilt Along was to start earlier but there was a shipping delay for the fabric so you have an extra month to get ready. I tested the pattern for this one for her a while ago. I pretty much hate adding borders but this one is interesting. Each round is a different border style. So nice to have someone else work out all the Math so all you have to do is cut and sew. I highly recommend you consider participating. Remember to visit the blogs of the other participants for the Rainbow Colour Challenge. If you have been following along you know that several of the other members of the group are offering free patterns on their blogs. Here is Sherry's list of participating bloggers. I have difficulty understanding the html information. I hope you don't mind that I "borrowed" your set of links. It's great that people are interested in this topic. This message is great. The red color is great, a good choice! Your work looks cool. Thanks for the good tips they are very important to me.